When/how did you first become interested in sustainable food systems? Good food was always a focus in my upbringing; a delicious from-scratch lasagna was very much how love was shown. It wasn’t until my college years that sustainability in food became of focus of mine. I lived in an old Victorian apartment in San Francisco with the daughter of an avocado and flower farmer, the daughter of a goat dairy owner and a bread-making enthusiast. At the time, I was dabbling in brand and marketing consulting for grass-fed meat producers. Our roommate meals we cooked together were the most seasonally conscious, locally sourced and sustainably minded that I have ever enjoyed. The rest of my life I will strive to recreate that access and experience for others. What is your background – education and professional – in food? I graduated from the University of San Francisco with a degree in entrepreneurship and innovation and a minor in environmental studies. I saw the opportunity to specialize in sustainable, environmentally aware business before it was a “thing.” After college, I went on to work in business development in the grass-fed ranching industry and farm to table event production. In between, I took some time to travel the world and farm in order to better understand the day-to-day life of those who are vital to our food system. What inspired you to start Roadbars? 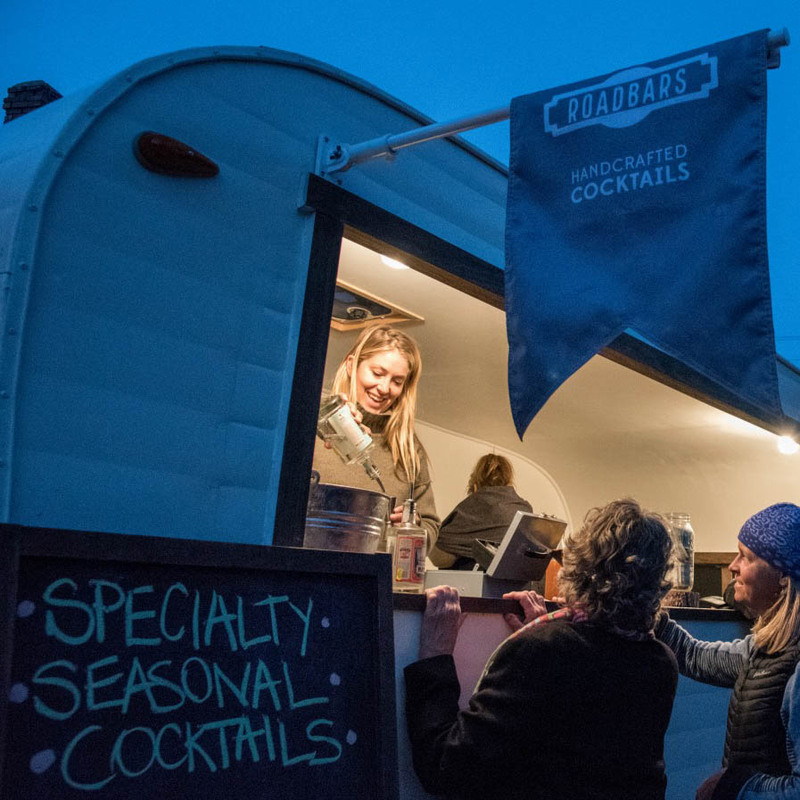 A love for vintage trailers and craft cocktails and an opportunity to promote seasonal consumption in a lighthearted way. This is my fun project! Roadbars allows me to get in the kitchen and be innovative with seasonal ingredients. What’s your favorite seasonal cocktail? The weekly shrubs we are crafting create my favorite cocktails. I just made an apricot sage shrub that was amazing! I was calling it the nectar of the gods. I have a sour cherry and lime shrub in the works right now and that was quite the process. In a day, my mom and I went down to Squash Blossom Farm and picked sour cherries. That evening, we pitted an apple bucket worth of them, combined that with lime zest and sugar to macerate. That will sit for a few days and then we will strain off the liquid and mix it with unfiltered apple cider vinegar. Sour cherry + lime + vodka = DELICIOUS! At the farmer’s market, I walk around and source my ingredients for next weeks’ mixers. I also go to local farms or hobby gardeners’ houses and harvest fruit that may go to waste. I source all my basil and herbs from Squash Blossom Farm. A lot of my fruit comes from Waterwheel Gardens. I look forward to using the melons from King’s Crown Organics. Sourcing with the season allows me to play with flavor profiles and sweet and savory combinations that people have never thought of when it comes to cocktails. Why are you passionate about fresh local ingredients? Once you have eaten a head of romaine lettuce that was harvested that morning and realize that is what it should have tasted like all along, its hard not to want that experience every time you eat. Why should a cocktail be any different? For our Gin Basil Lemonade cocktail (a customer favorite), I pick up 2 pounds of just harvested basil from Squash Blossom Farm every Monday and by that evening it is made in to a basil syrup. On Tuesday, people are drinking it with fresh squeezed lemon juice and locally produced gin. That’s a fresh, seasonal as local as possible craft cocktail. Every farmer and rancher that gives his or her every day to producing quality product to feed their community. For consumers to stop dictating when products should be available. Vegetables, fruits and meats are all seasonal. Learn what those seasons are and eat accordingly.